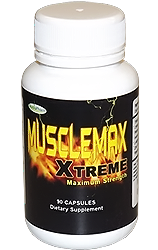 MuscleMax Xtreme works by supporting the growth hormones in the body and increasing the muscular strength. MuscleMax Xtreme also increases the free testosterone levels and improves the secretion of IGF hormones, which are primarily responsible for building muscles. MuscleMax is not only made for athletes but for every person who wants to become a sports person or who just wants to build strength.